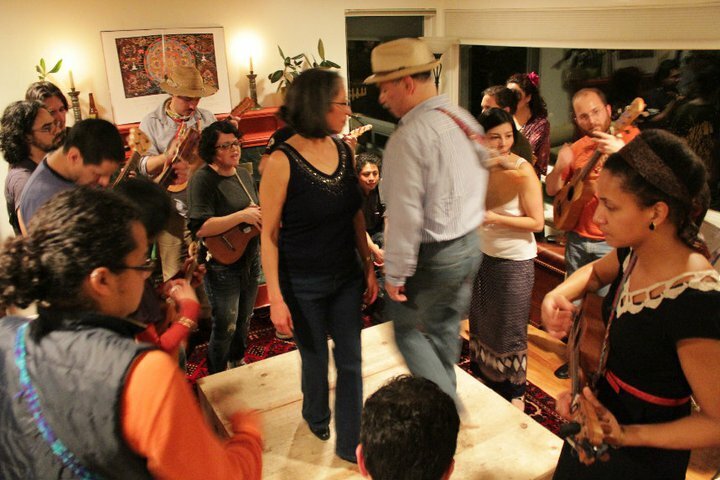 The Seattle Fandango Project, a local organization that promotes community through music, verse and dance, has been named the recipient of the 2012 University of Washington Vice President for Minority Affairs and Vice Provost for Diversity Community Building Award. The award will be presented at the Multicultural Alumni Partnership (MAP) Bridging the Gap Breakfast, on Sat., Oct. 27, at the Husky Union Building ballroom from 8-10 a.m. The award recognizes a University of Washington student, staff member, faculty member, or community organization whose efforts toward positive change on campus have resulted in multicultural community building. The Seattle Fandango Project (SFP) builds relationships with diverse groups in Seattle and fandango practitioners from other parts of the United States and Mexico, promoting joy, healing and social activism, while providing a welcoming space for families to make music together. Its practice is rooted in the fandango traditions of Veracruz, Mexico, and the broader community arts movement Fandango Sin Fronteras (Fandango Without Borders), built over the last decade by musicians and community organizers in Veracruz and California. SFP first took shape in 2009 when Seattle area fandango practitioners, educators, artists and activists coalesced around workshops on the UW campus and in the community. The workshops were facilitated by Martha Gonzales, Quetzal Flores, Son de Madera (a band from Veracruz) and UW School of Music visiting artist Laura Rebolloso. SFP activities currently include free weekly public workshops at El Centro de la Raza and monthly fandangos at various sites. Group learning integrates people of different ages, skill levels and cultural backgrounds. SFP facilitates exchanges with fandango practitioners from Mexico and other regions of the U.S., and strives to form relationships with diverse groups in Seattle and across the state. It looks for ways to support partners through the participatory practice of fandango to call attention to important social issues and help with fundraising and building community. SFP’s many collaborators and supporters include several University of Washington programs such as the School of Music; Simpson Center for Humanities; Department of Gender, Women and Sexuality Studies; Diversity Research Institute; Convivencia; Samuel E. Kelly Ethnic Cultural Center; Latin American & Caribbean Studies Program; Dance Program; School of Social Work; and the Office of Minority Affairs & Diversity. Community collaborators and supporters include El Centro de la Raza, De Cajón Project, Casa Latina, Union Cultural Center, Seattle City Office of Arts and Culture, Women Who Rock Collective, Youngstown Cultural Arts Center, Washington Hall, Hidmo Restaurant and Community Center, American Music Partnership of Seattle and many area schools. Previous award winners include Cynthia del Rosario (UW Information School, 2011), Ja-Anana Elliot (Foster School of Business, 2010), Dr. Michelle Habell-Pallán (Department of Women’s Studies, 2009), Michael Verchot (Foster School of Business, 2008), Carolyn Chow (School of Nursing, 2007), Dr. Gino Aisenberg (School of Social Work, 2006) and Dr. Sheila Edwards Lange (Office of Minority Affairs and Diversity, 2005). Learn more about the Seattle Fandango Project on its web site.